Newburn House benefits from being protected by Sto’s recently launched StoColor Dryonic façade paint. 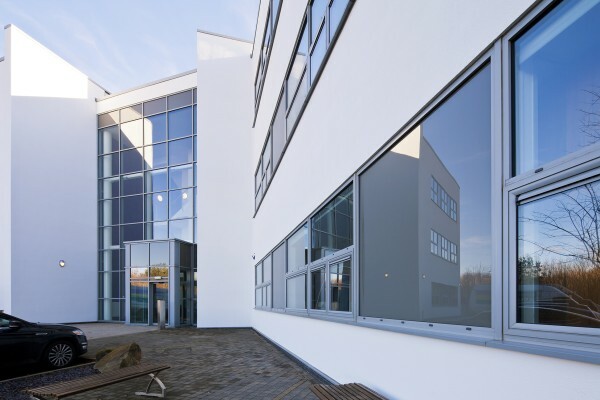 Dryonic paint was chosen to refurbish Newburn House on the Newburn Business Park, on the basis of its’ advanced ‘stay clean’ performance, ensuring that the building will retain its attractive new appearance well into the future. StoColor Dryonic paint was inspired by special micro-textures found on the shell of the fog-basking beetle. Just like the beetle’s shell, the paint uses a special composition of binding agents and filler material to create micro-textures that both repel water and channel it away at the same time. This enables the surface to dry rapidly, with any dirt being quickly washed away. The opportunity for microorganisms to grow on the surface is dramatically reduced, so any risk of staining or marking is significantly lower than other conventional façade finishes. A new façade paint with micro-textures that allows water resulting from rain, dew and fog to run off the façade almost instantly, leaving the façade dry in no time at all.